We started the day with an NRA Basic Pistol Course, one of my favorite courses to teach. One class member was the wife of a concealed carry guy. She had become interested in firearms from conversations with him and he wisely suggested she take lessons from a pro, rather than trying to learn from him. She was a delightful student, who after learning about firearms safety, the various firearms types and firing her first shots decided to buy both a target pistol and a defensive handgun. She’ll be in in one of our future CHL classes. Another student, a elementary school teacher, is looking for a new hobby and thought this might be it. I hope so. She did well as a student. 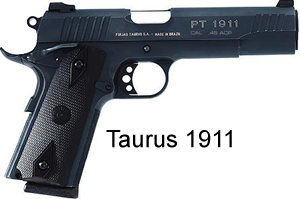 Then there was the young man who had recently purchased a Taurus 1911 and wanted to learn all he could about it. Great gun. He shot our 22 pistols at the range, then his own .45. Afterwards he came back to the shop where Jerry showed him how to take his gun apart, clean it and put it back together. I was cleaning some of my own guns at the time and he was fascinated by the fact that I took out my .45 caliber Springfield XDm, unloaded it, cleaned it and put it back together while Jerry was struggling with the bushing on the 1911. “How many rounds does that hold?” he asked. “Fourteen,” I replied. “Fourteen rounds of 45 ACP?” “Yep.” The Taurus 1911 is a fine gun, but you can see why some of us elect to carry modern, plastic guns instead. After the NRA class a customer brought two very interesting guns in to have us teach him how to disassemble for cleaning. This is where the varying talents of the Texas Gun Pros comes into play. Whereas I enjoy the personal side of carrying and using firearms – defensive scenarios, carry options, holsters, ammo, etc., Jerry is really into guns and I’m glad he is. I continue to marvel at his knowledge and mastery of a variety of firearms. 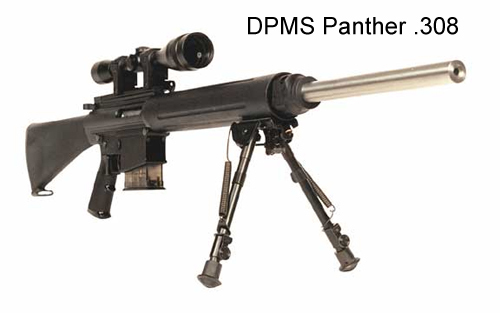 The first of the two guns was an AR rifle, a DPMS Panther in 308 caliber. I learned about M16s in the Army and have owned an AR-15, but I don’t know these guns inside and out like Jerry does. He not only disassembled, cleaned and reassembled this fine firearm, but he taught the customer a lot about his gun in the process. The next gun the customer brought out was a SAIGA 12 gauge shotgun. This is a Russian made gun based on the AK-47 platform. Again, Jerry seemed to know the gun inside and out and pointed out many of its features to the customer while taking it apart, cleaning it and reassembling it. He then had the customer do this as he had with the Panther. 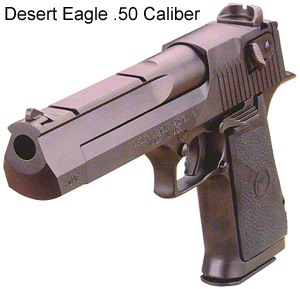 An added treat of the day was shooting Jerry’s 50 caliber Desert Eagle. You’ve seen the YouTube videos – well, if you hold onto it, the kick isn’t that bad. It sure is loud, though, and you feel the percussion as much as you hear the noise. I did manage to put three holes in the target, each touching the other. Of course they were such big holes, maybe that wasn’t much of an accomplishment after all.